Why on earth would I make homemade marshmallows? That it the question that Mr DD asked me when I told him what I had been up to while the girls were sleeping. My answer because I wanted to, the recipe sounded fun and I am sure they will taste soooo much better than the shop bought ones. Guess what? They taste 1000 x better plus you get the brag factor of "oh yeah I just whipped up my own marshmallows". I also had a lot of special requests to share my recipe so I would hate to disappoint. 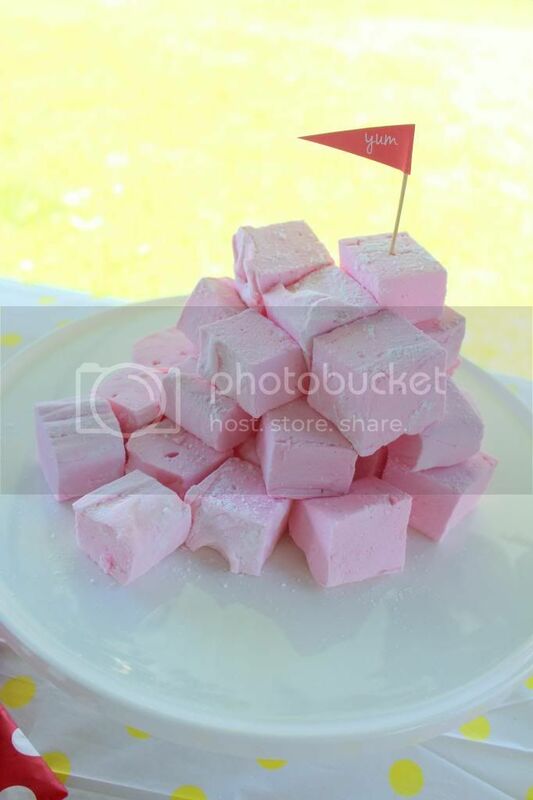 Here is my recipe for Pink strawberry Marshmallows adapted from a recipe by Donna Hay, don't be scared, if you have a mixer it is actually quite easy to make them yourself. **You will definitely need a mixer and a sugar/candy thermometer to make these, the thermometer if you don't have one already can be found at any kitchen store and are not too expensive. Turn your mixer on using the beater attachment (I have a kenwood which I put onto the medium) and carefully pour the hot sugar mix into the bowl. Turn the speed all the way up and add in a few drops of colouring to get the desired colour and the strawberry oil. Keep your mixer running for 7-8 minus until the sugar and gelatine mixture becomes very light fluffy and has cooled right down. While you are waiting on the mixer to finish, line a 20cm x 20 cm tin with grease proof paper and give the inside a light spray. When your marshmallow is ready it will be very light and fluffy looking and have very little movement when you lift up the beaters. Working quickly spoon the mixture into the greased tin, smooth over with a spatula. When it is set carefully tip it out onto a cutting board dusted with the icing sugar and cornflour mixture cut into squares with a hot knife and put the squares into the dusting mixture. ** As the set marshmallow will be really sticky you may want to keep running the knife under hot water and keep your hands dusted with the icing sugar mixture. Allow the marshmallow to come back to room temperature before serving and enjoy! Just as a side note, I have been experimenting with creating a Chocolate marshmallow recipe, yes I said CHOCOLATE marshmallows, whilst they are completely delicious they were a little too ugly to photograph so I will be tweeking the recipe a little to get them to perfection before I share! They look so pretty. Thank goodness you took a photo to share. They did look quite beautiful on the plate Michelle, to be honest the only reason I think I managed to get a photo of them was because everyone was too scared to mess up my marshmallow pyramid! Mum used to make homemade marshmallows and I loved them. Especially the marshmallow bunny she'd do at Easter time. Oh that is a great idea to do them for Easter Natalie! Did she use a mold to make it into a bunny or a cutter? So yum! They still scare me a little but they look so good I am very keen to try! Definitely not scary once you give it a go! I especially like recipes that require thermometers as it makes it quite fun and more like a science experiment. Oooh they look so yum. And I don't mind what the chocolate ones look like-ill eat them with my eyes closed if I have to. Sure they're delicious ! Yummmmmm!!! My aunt made homemade peppermint marshmallows that I absolutely loved! 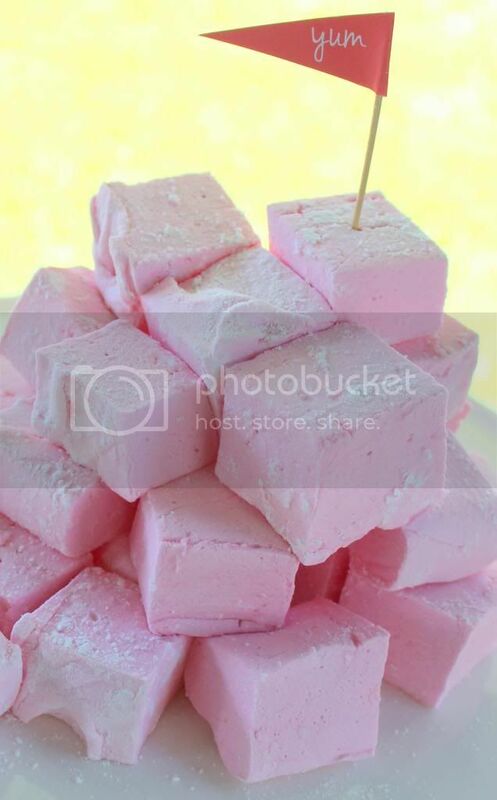 These pink strawberry marshmallows look so amazing!!! Peppermint marshmallows sound delicious! This recipe could easily be changed up to make peppermint ones ahhh the possibilities are endless! Yummo!! Took me back to when I was little - my Mum always made marshmallows for the school cake stand fundraisers, she would roll hers in coconut which was a little bit of extra awesome. I was just thinking that toasted coconut marshmallows would be awesome. It is amazing how little sweet treats like this can take us right back isn't it?